In The Legend, Callie Reed doesn't need a man to protect her. An expert sharpshooter and renegade hacker, this Texas-born spitfire's got the skills and the courage to stand up to any danger-no matter how deadly. 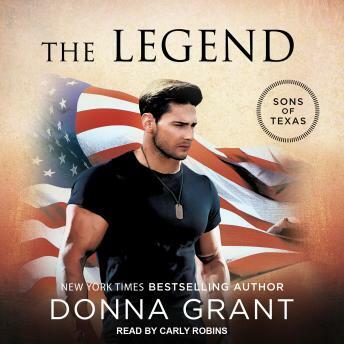 But when she becomes the target of a shadowy organization known as the Saints, Callie is forced to team up with the one man she can't outshoot: the gorgeous, and infuriating, Lone Star legend named Wyatt Loughman . . .
A Delta Force Colonel with a rock-hard body and stone-cold heart, Wyatt has been teasing and tormenting Callie since they were playmates on his family's ranch. Of course, he's wildly attracted to the fiery, strong-willed Callie. But he's always hidden his feelings behind a wall of Texas tough and military cool, even as he's burning up with desire. Can Wyatt save Callie's life-without putting her love in the line of fire?